Today marks the release of Synapse’s Coal Asset Valuation Tool (CAVT) Version 6.0. We are thrilled to announce this latest version, which features key data updates and usability enhancements, including the latest AEO gas and coal prices, full updates to environmental control presets, and a smaller file size so users can run CAVT faster on any machine. CAVT is a spreadsheet-based database and model developed by Synapse that analyzes the future economic viability of coal units. CAVT estimates the costs for individual coal units to comply with environmental regulations and compares these costs to electricity market prices. It aggregates publicly available data on non-cogenerating coal units and combines this with publicly available cost methodologies to calculate the cost of complying with environmental regulations. The calculated future cost of each coal unit is compared to the estimated future cost of wholesale market purchases to determine future economic viability on a unit-by-unit basis. An overhaul of the backend, leading to a file one-third of the size of previous versions—users can now run and save CAVT faster on older machines. Even without environmental controls, many existing coal plants are currently uneconomic when compared to other market purchases. Once the costs of these controls are taken into account, the economics of these plants worsen. 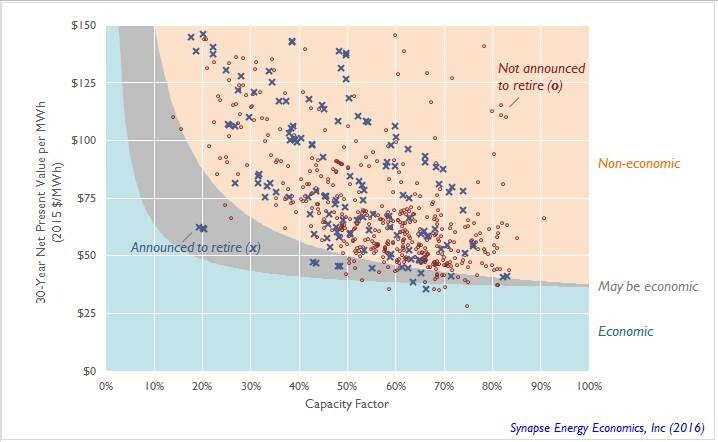 Figure 1 compares the future economics of coal units that are slated for retirement and coal units that are currently not announced to retire. While this figure does account for operating and capital costs of likely environmental retrofits such as scrubbers, baghouses, cooling towers, effluent limitations, and ash remediation, this figure does not include costs associated with carbon dioxide, such as the type that might be imposed by the Clean Power Plan. Even without these additional carbon costs, few coal plants are economic compared to market purchases on a forward-going basis. Note: Each “x” and “o” represents a single coal unit, operating at an average historical capacity factor. If units are in the blue area, they are economic compared to current market conditions. If units are in the orange area, they are non-economic, and should be retired. Units in the grey area may or may not be economic. CAVT is free and open source. To download CAVT 6.0, visit http://www.synapse-energy.com/tools/coal-asset-valuation-tool-cavt. For more information or to request assistance with CAVT, contact Pat Knight.